If shoppers don’t demand a product, retailers aren’t going to give it much room on their shelves. But if retailers don’t display the product, shoppers won’t get a chance to buy it or necessarily think to demand it. This is the sort of circular conundrum beer brand Foster’s faced with its Oil Cans, which,at 25.4 ounces, are more than twice as largeas the typical U.S. can of beer. Males 21-31 who typically buy beer from convenience stores would pick up just one or two cans at a time, to drink after work or during the train ride home. They weren’t buying multiple cans for parties, picnics, and other social functions, in part because they were so cumbersome. This in turn meant convenience stores were reluctant to devote much shelf space or signage to the product. Working with Arc Worldwide/Leo Burnett, MillerCoorsFoster’screated free carriers that let shoppers easily transport three Oil Cans in one hand. 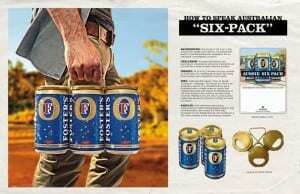 Because three Oil Cans are the rough equivalent to six regular beer cans, Foster’s dubbed it an Aussie Six-Pack. Foster’s gave away carriers at the annual convention of beer distributors in March 2012, explaining how they would help the distributors’ customers—the retailers—sell more Foster’s. The company also created point-of-sale kits, complete with signage, carriers, and displays, for the stores and offered them the option of downloading one UPC code on the carrier so that they could swipe three Foster’s Oil Cans at once during checkout. To make its case to consumers, Foster’s aired TV spots showing its beer being consumed in social situations and clarifying the Aussie Six-Pack concept. Banner ads, video billboards, and other online ads on sites popular with young males reinforced the commercials. Distribution in convenience stores increased four percent as a result, and sales to convenience-store customers jumped 16%—quite a turnaround from the three percent decline seen prior to the program. And in local markets where the TV ads ran on the Gas-Station TV network, sales jumped 32% in the two months the spots aired.